WHERE DID HEARING AIDS COME FROM? Modern hearing aids are remarkable: small enough to hide inside of your ears, yet they can allow you to hear even when your ears fail you. If you have ever been stuck somewhere without the use of your hearing aids, you probably appreciated them even more than you already did after that experience. We often don’t think about it, but did you know the first hearing aids were invented over 300 years ago? Over 300 years ago, the first prototype of hearing aids, or “ear trumpets,” were developed. These first large hearing devices were akin to holding up an orange traffic cone to an ear to magnify noise from one side. The horn-shaped ear trumpet saw some development in the 1700s, but there was still no technology for amplification. The nineteenth century brought great innovation, including electricity and telephones. These technological advances could also be applied to hearing devices. Electrical transmission of speech was made possible in 1878 by Thomas Edison’s carbon transmitter, and that technology paved the way to amplification that would eventually be modified for hearing aids. 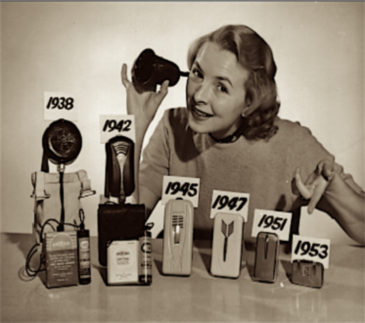 Vacuum tubes were another technological advance invented in 1920, which allowed for a smaller size for hearing aids. With the added innovations of amplified sound and improved frequency, the hearing aid was trimmed down to a small box and a receiver. Though it was now much more convenient to use them at home, they were still not portable. The first wearable hearing aids that could be used easily outside the home were connected to a receiver and battery by a small wire. The battery and receiver were usually worn on the leg. The second World War brought circuit board technology, which allowed hearing aids to become even easier to use on the go. Zenith Radio introduced hearing aids that could be worn behind the ear in 1964, and by 1996 hearing devices were fully digitized. Modern hearing devices we use today have been developed from there: customizable hearing aids that can be programmed for convenience and ease. Today’s hearing aids are more discreet than ever before, and 90% of them are fully digital. With swift advances in technology, we can look forward to even better hearing aid technology in the future.